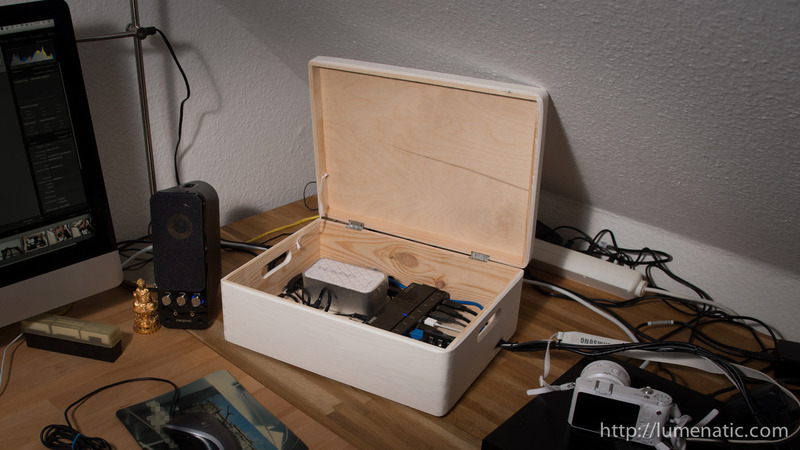 Three months ago I created a battery charging / data connection box (see the making of here). It is a wooden box into which all my battery chargers are placed, fastened with velcro. A seven port USB 3.0 hub connects to a bundle of data cables for mounting all sorts of devices. I have been using this box for over three months and would like to share some thoughts and experiences with you. First of all: IMPORTANT NOTE ! Never close the box while batteries are charging ! Battery charging generates heat which needs to escape. If you close the box during charging operation you might risk a fire ! Having all chargers in hands reach and not having to bother about the wiring is great. I am so relieved that don’t have to rummage around in a box for the correct charger anymore or find a spare power plug. Charging your batteries (I have four different battery types to charge) is now achieved in a very convenient way. The USB hub also provides extra comfort. I can plug my camera directly to one of the cables from the bundle and I am ready to go. So same thing here – life has become easier. But the design turned out not to be perfect. When I connected my D800 to the USB 3.0 cable of the hub Lightroom stopped importing the images from the camera at random points. I got an error message that the files were not readable. I had to reconnect the camera and import again. At first I thought of a faulty memory card, but after a while it dawned on me that the USB hub might be the issue. So I used another USB cable and connected it directly to my iMac. The result – a smooth import, no problems. I am not sure what exactly causes the problem. Perhaps the combined cable length of the USB cable and the cable which connects the hub to the iMac is too long and packet loss occurs. Just a theory. But I am pretty sure about the cause of the second problem I encountered. While I can connect and charge my iPhone perfectly with a cable connected to the hub my iPad won’t charge. The cause is clear – not enough voltage. Note that there are USB hubs on the market with dedicated charging ports for smartphones and tablets. These ports put out more juice. I saw such hubs when I chose the one for my box but did not buy it since the distribution of the ports on the hub did not go well with the component layout I planned (some ports would not have been accessible). To wrap it up – nothing is perfect at the first attempt except Chuck Norris. But despite two minor issues the box made my battery and cable management a lot easier. The components are easily accessible, can be removed if necessary (velcro !) and stored out of sight when not needed (close the box). It is an effective and inexpensive solution (you have to buy the box, some paint if you like and a USB hub).